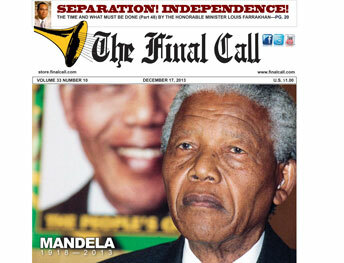 (FinalCall.com) - Nelson Rolihlahla Mandela has died and the historians are appraising his legacy. Mr. Mandela was without doubt a soul of consequence and is widely viewed as the personification of struggle. But the long walk to freedom was not easy for Mr. Mandela and the South African people—and the road ahead will have its share of difficulties. The former political prisoner and first Black president of a country once subjected to vicious White-minority rule was lionized, mourned and remembered in state tributes, church services and impromptu memorials. “We will continue to carry on Mandela’s legacy of courageous activism. Even when unjustly imprisoned on Robben Island by the apartheid government, he and his fellow activists in the liberation movement, inspired us all with their vision of a free, just and democratic South Africa,” said Nicole Lee, president of TransAfrica, the Black lobby for Africa and the Caribbean. TransAfrica was a leader in the fight against apartheid and freedom for Mr. Mandela. 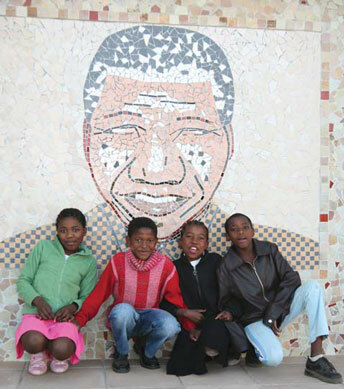 “No obstacle was too great for Nelson Mandela in his quest for a brighter tomorrow. As we work to change powerful systems that perpetuate economic and social injustice, we are reminded of Madiba’s courage,” said Ms. Lee. The year 2014 will mark 20 years since the end of apartheid and the coming to political power of Mr. Mandela and the African National Congress. There is widespread joblessness and disparity between the country’s rich and poor. South Africa has double-digit unemployment at 27 percent and poverty levels are 56 percent. There is a high rate of HIV-AIDS for South Africans ages 17- to 49-years-old. South Africa is still considered one of the model countries on the African continent with a strong economic and high literacy rates. But violent crime is a problem and this past year was especially tough. Though progress since the apartheid era and the presidency of Nelson Mandela is clear, the challenges cannot be overlooked as South Africa is preparing for 2014 elections which the Independent Electoral Commission (IEC) has yet to announce a date for. The ANC will not be seriously challenged by any outside parties in the elections, but social fault lines are another matter. Last year the world witnessed the killing of 34 striking miners by the South African police force revealing the potential for class-based conflict in the country. The miners were demanding better wages and the situation escalated with security guards for the mining company killed and officers firing on workers, charging the workers were armed and dangerous and had attacked officers. A World Bank said broad access to jobs is crucial to alleviating the country’s economic inequality. South Africa has largely fallen short of that goal, with an unemployment rate averaging above 25 percent since 2000. The country is still affected by its loss of nearly 1 million jobs between 2008 and 2009 and a recession for the first time in 17 years. “Since Mandela’s death, the same international powers that keep the structural conditions alive for Blacks suffering worldwide, are universally heralding the man and his great achievements. The same corporatocracy who helped keep South Africa and the global South in economic chains and political instability did so to increase their money-making profits and are lining up to have their pictures taken at the funeral,” observed the attorney, activist and writer Ezili Danto, champion for Haitian rights and progress, in a commentary online. “Madiba,” the traditional name of the Nobel Peace Prize winner, came to power after emerging from prison in 1990 after 27 years. Upon his release there was fear among the ruling elite that a bloody civil war between recalcitrant Whites—openly backed almost exclusively by America and Israel—with the rising Black masses was inevitable. The Boers, the name given to descendants of the White colonizers who invaded the land, were arrogant and unrepentant. 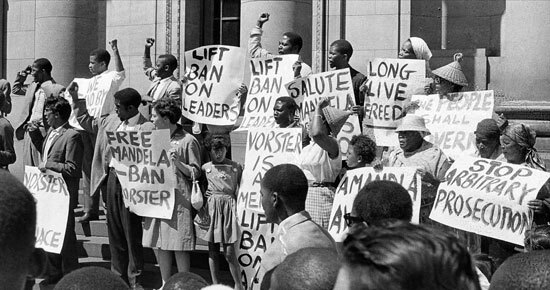 The Blacks, crushed to the bottom of oppression had gone from making legal petitions to blood-soaked street protests, to armed struggle in 1961, to successfully making the regime ungovernable and isolated politically, culturally, and economically through sanctions and boycotts. “We know that the turning point in the liberation of the entirety of Southern Africa—including South Africa—came in mid-1988 when Cuban troops in … Angola assisted by Angolans, Namibians and South Africans defeated the apartheid army on the battle field,” Dr. Gerald Horne of the University of Houston said. Cuba was backing wars of liberation in Angola and Namibia—then a South African colony—that positioned it militarily as an ally of the anti-apartheid movement, raising the possibility of Cuban troops marching on Pretoria from the northern border of South Africa and “forcibly eject bodily, the apartheid leaders” from office. “That prospect made the apartheid leaders more susceptible to seek reason and they began to negotiate seriously and 18 months later Nelson Mandela was freed and his party, the African National Congress was unbanned,” Dr. Horne told The Final Call. The decision to negotiate with the African National Congress and Mr. Mandela, who had been convicted, sentenced to death for treason and jailed for terrorism and freedom fighting, was a bid, at minimum, for White survival. At maximum it was a sinister attempt to hold on to power behind the scenes—in particular economic power. The ANC was committed to a multi-racial society not prone to drive the Whites into the sea and retake land. Other South African voices, like the Pan-Africanist Congress of Azania stressed retaking the land, pressing forcefully and quickly to repossess White wealth and corporate entities while beating back debilitating Black poverty and deprivation. Even his then-wife, his voice and representative to the world for many years, Winnie Mandela, was portrayed as a militant in South African and Western media versus the more conciliatory image the press that once refused to report on Nelson Mandela started to present. “Mandela is a global iconic leader because he publicly forgave and absolved global White supremacy—not because he liberated Africans,” said Dhoruba Bin-Wahad, an activist and former U.S. political prisoner for 19 years via Facebook. “Indeed the same features of European settler ownership of mineral rich lands hasn’t changed in South Africa. South African workers are still exploited by international finance capitalism’s exploitation of South African resources,” said Mr. Bin-Wahad. “It’s a great thing that Nelson Mandela became the first Black African democratically-elected president of South Africa,” commented Dr. Wilmer Leon. While Mr. Mandela was “the democratically-elected president of South Africa he did not control the natural resources of his country; he did not control the military, and did not control the factors that impacted its economy. That’s the reality of being the first Black president within the greater context of a White supremacist power structure,” he wrote in commentary published Dec. 8, two days after Mr. Mandela’s death. “We thank Allah (God) for the power of the former president and the former political prisoner Nelson Mandela’s words and the power of his deeds to see South Africa become ‘free.’ But the work that he did needs to be completed and it will not be completed until land taken from Black South Africans is returned to Black South Africans, and the wealth that is under the foot of South Africans that has been appropriated to others comes back to the indigenous people to whom that wealth belongs,” said the Honorable Minister Louis Farrakhan, who met with then-President Mandela in a 1996 visit to Johannesburg, while on a 28-nation World Friendship Tour after the successful 1995 Million Man March. Mr. Mandela was trying to buy time for South Africans to take over not just government but also the economy, Minister Farrakhan told The Final Call. Otherwise Blacks in South Africa would remain perpetually poor, he explained. But Mr. Mandela never denied those who supported him and the ANC, despite pressure from the West and from Zionists, Min. Farrakhan added. Revolutionaries like the late Libyan leader Muammar Gadhafi, the late Palestinian leader Yasser Arafat and Cuba’s Fidel Castro befriended the ANC while the U.S. labeled Mr. Mandela a terrorist and the CIA gave White South Africans information that allowed for his capture, Min. Farrakhan noted. Likewise when Jewish leaders tried to squelch any meeting between the Minister and Mr. Mandela, the freedom fighter refused to buckle. He met with the Minister, even changing his schedule due to travel difficulties, recalled Abdul Akbar Muhammad, international representative of the Nation of Islam, who arranged for the travel from Zaire and meeting in South Africa. Min. Farrakhan had previously met Mr. Mandela in 1993 in Chicago when the then-president of the African National Congress was raising funds for voter education prior to the country’s first multiracial election in 1994. The Minister donated $10,000 to that cause. As late as 1997, three years into his presidency, Jewish leaders in South Africa were calling Mr. Mandela anti-Semitic for his refusal to abandon Mr. Arafat, and Col. Gadhafi and were angered by his words against U.S. military adventures in Iraq. Mr. Mandela was a man of principle and “his aim was reconciliation to save the country from a bloody war which would have torn the country to pieces and destroyed the infrastructure of the country, then he would have to rebuild it, or build it again. So he gave Africans in South Africa a chance to grow and he gave White people a chance to grow. But he wanted Africans to develop the expertise that would allow them to govern not only government, but govern the economic sphere of South Africa’s development without which the Blacks would always be weak and poor in the midst of plenty,” said Min. Farrakhan in an exclusive interview. “The cause that Mr. Mandela lived for is eternal. We who love and respect him must pick up that cause and complete the work that he devoted his life to,” said Min. Farrakhan.